The ultimate shop HZMMMYYXGS1068 on handi offer Autumn new trend wild casual men's trousers groom groomsman wedding trousers XF001 trousers - the best Home items direct from factory help you to save more and spend less,buy now today! Men's and women's trousers straight work suit trousers, women's professional dress pants, autumn and winter trousers, OL pants, trousers, trousers. Men's and women's trousers in autumn and winter, no ironing straight pants, business suits, formal pants, business suits, business suits. The free sale promotion of the major clearing activities is dedicated to the backlog of miscellaneous men's shorts in stock. The new men's jeans in autumn and winter are elastic, comfortable, high-waisted, iron-free, middle-aged and old-aged business men's pants. The new style of body-building trendy trousers in the spring of 2000 does not deform men's cotton business trousers. 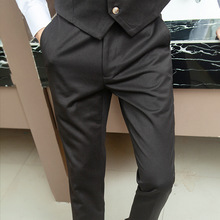 Simple elastic trousers, business leisure, work, men's suits, business gentlemen's trousers.